Our CAD Software is FREE and packed with useful options usually only found in expensive CAD packages. Novices and professional engineers alike have praised the rich feature set and easy-to-learn user interface. Are you new to CAD? No problem! Use one of our design wizards and you won’t have to design from scratch. Our wizard library includes pre-drawn parts like flywheels, heatsinks, hex nuts, front panels and more. Just fill in your part specifications and the wizard will generate a modifiable drawing that you can order as is, or change. 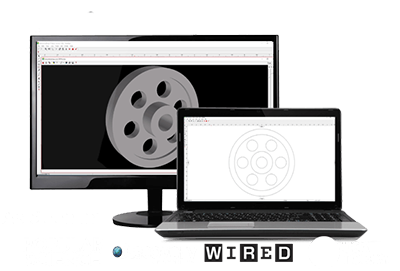 Like having an expert mechanical engineer at your side, eMachineShop CAD analyzes your design and provides warnings about impractical shapes, non-machinable features and incompatible materials. For example, you might be alerted for having a bend too close to an edge, a hole too deep and improper finish. eMachineShop CAD helps you minimize your production costs by guiding you to create shapes that are economical to machine. The eMachineShop website also offers numerous cost-reduction tips. No need to request and wait for price quotations. The eMachineShop CAD software generates a price in seconds by analyzing the shape, material, finish requirements, and machining operations necessary to manufacture your design – from quantity 1 to 100,000. Ordering custom machined parts is quick and easy. Run the CAD software price analyzer, choose a delivery time and order directly from the software. eMachineShop CAD is connected directly to eMachineShop’s production facility, so we’ll get your files the moment you submit your order!